Teaser Tuesdays is a weekly bookish meme, hosted by MizB of Should Be Reading. Two-wheeled thoughts is my own. 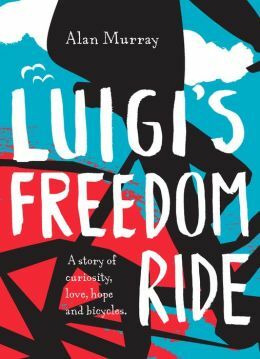 I am very excited about Luigi’s Freedom Ride, a novel that accomplishes what Life is Beautiful did in film: a story about the horrors of World War II, but that is also funny, joyful, hopeful. And bicycles! Really! Go out and get this one. Review to come, but I wanted to share two bike-related lines that amused me. Who there could possibly doubt the determination of this young, fit, self-assured bicycle man? Who, indeed? Yes, I regret that this has to be so man-centered; but to give a little context, the setting is a 1930’s war-bound Italian culture of machismo – and the next lines are spoken in a military training camp. All that truly mattered was mastery of the bicycle, and the unbreakable, manly bonds that flowed from such mastery. Manly bonds! And with that I leave you. Thank you so much for your kind words in relation to my story of Luigi. I wanted to write a tale that lifted the spirits and, perhaps, brought a tear to the eye. My hope is that you enjoy the reading as much as I enjoyed the writing. By the way, your web site is ten out of ten! Alan, thank you so much for stopping by with these kind words! Your book did all of that; I enjoyed it greatly. My review will come via Shelf Awareness closer to the pub date, if you’re interested. Thanks for an enjoyable read that was, yes, uplifting as well as profound. Keep up the good work! Yes, I’ll certainly have a peek at Shelf Awareness and your review. Without reviewers and readers, writers would have an even tougher time of it! So far here in Australia the reviews have been most heartening – reviews from Terry Purcell at Booktopia, The Newtown Review of Books, The Good Reading Guide. Lots of staff picks. It even made the Indie top five after it was released here. Anyhow, keep up your good work and get some words on paper every day. Good luck with this book; I feel sure the praise will keep rolling in.